Laine Fischer and Paulina Scheid celebrate Fischer's second period goal. Photo courtesy of David Faulkner, SPX Sports. SAINT PETER, Minn. – The Gustavus women’s hockey team finished off a sweep of Concordia on the weekend with a 5-1 win at Don Roberts Ice Rink. With the win the Gusties move to 13-5-5 overall and 9-3-4 in the MIAC. 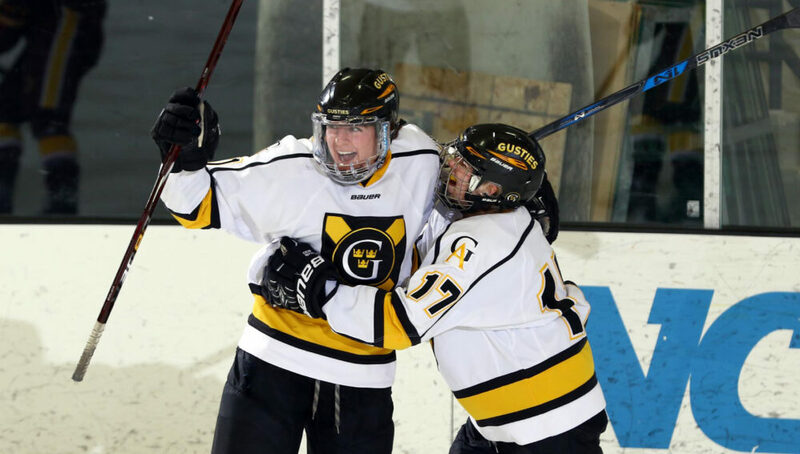 Gustavus picked up right where they left off last night when Amelia Vosen (Jr., Nowthen, Minn.) found the back of the net on the first shot of the game by either team, with assists going to Madigan Goldsworthy (Fy., Chaska, Minn.) and Kristen Cash (Jr., Roseville, Minn.). The Gusties held their 1-0 lead into the second period where they tacked on another goal at the 13:37 mark when Laine Fischer (Sr., Northfield, Minn.) fired in a shot for her second goal of the weekend. Gustavus went into the third period ahead of the Cobbers 2-0 and outshooting them 24-11. In the third period the Gusties were outshot 11-10 but they managed to outscore the Cobbers 3-1. Allie Stanger (Sr., Paynesville, Minn.) kept her solid weekend going when she scored her third goal of the series with assists going to Kristina Press (Fy., Cottage Grove, Minn.) and Kayla Vrieze (Fy., Eagan, Minn.). The Cobbers scored to pull the game within two but that was the closest they would get. Empty net goals late by Stephanie Anderson (Fy., Blaine, Minn.) and Vosen extended the Gustie lead to four which they held onto for the victory. Amanda DiNella (Sr., Oakbrook Terrace, Ill.) got her 12th win of the season in net for the Gusties making 21 saves while allowing one goal. The Gusties will next be in action when they host Saint Benedict on Friday at 7 p.m.